Orlando is a wonderful place to get up close to all kinds of animals, great and small. There are lots of ways for everyone in your family to interact with creatures of all sorts – here’s our list of the top 10 animal encounters at Orlando theme parks. See lions roam at the Edge of Africa walking path at Busch Gardens Tampa. Here you can get up close to the king of the jungle, as well as the rest of his pride, with only a sheet of glass separating you. A special viewing area inside an old run-down truck allows you get even closer. Also on the path you'll spot hippopotamus, lemurs, meerkats and crocodiles in re-creations of their natural habitats. Have you ever wanted to pet a kangaroo? Walkabout Way features many animals straight from the land down under. 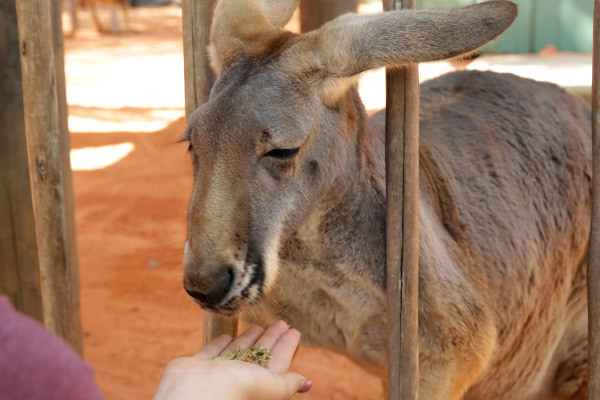 Guests are encouraged to purchase food to hand-feed the playful kangaroos or adorable wallabies, and you're even allowed to pet them! You can learn all about these marsupials, plus other Australian animals like Emu and the umbrella cockatoo. This is the perfect place to take incredible photos of fluttering birds. If you purchase a cup of nectar before entering this massive aviary, the colorful lorikeets will land right on your hand for a sip! These beautiful and friendly birds love sharing nectar while perched in your hand. You'll also see hornbills, pheasants and many other birds of a feather. One of the largest interactive dolphin pools in the world, Dolphin Cove at SeaWorld Orlando allows you to get near these majestic mammals. Watch bottlenose dolphins play and jump above the water or head to an underwater viewing area to see them swim gracefully. 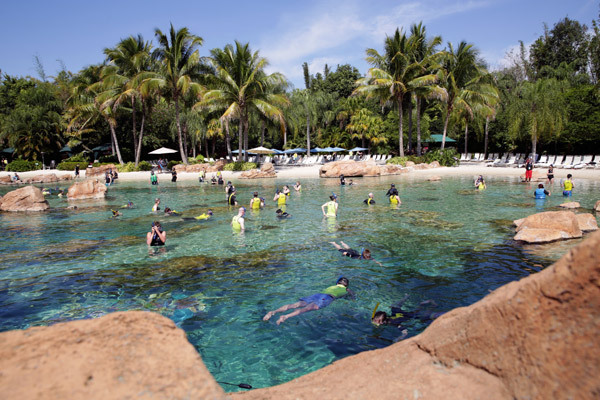 Nearby at Stingray Lagoon you can reach in and touch the velvety stingrays and even feed them. Don't be fooled by the name though, these rays are gentle and don't actually sting. You can visit the colony of penguins after riding Empire of the Penguin, or you can skip directly to the penguin habitat. You may want to bring a jacket because these penguins prefer the freezing cold temperatures of Antarctica. Here you can see penguins waddle around in the snow and glide effortlessly through the water. There are five different species living together in this expansive habitat. Watch the gorgeous California sea lions and cute harbor seals as they swim and play, or just lay out on the rocks on a hot day, at Pacific Point Preserve. Hear the sounds of roaring sea lions and barking seals in this lagoon surrounded by massive rock formations. Feeding times are available so you can toss some fishes to these fun-loving animals. After your adventure through the African outback on Kilimanjaro Safaris, explore the tropical Pangani Forest filled with even more African wildlife in the Gorilla Falls Exploration Trail. Here you'll come face to face with a troop of western lowland gorillas, swimming hippos and scampering meerkats. Don't miss this exciting walking trail located right next door to Kilimanjaro Safaris. Explore the lush Anandapur Royal Forest and you may encounter tigers, monkeys, bats and dragons on your journey. 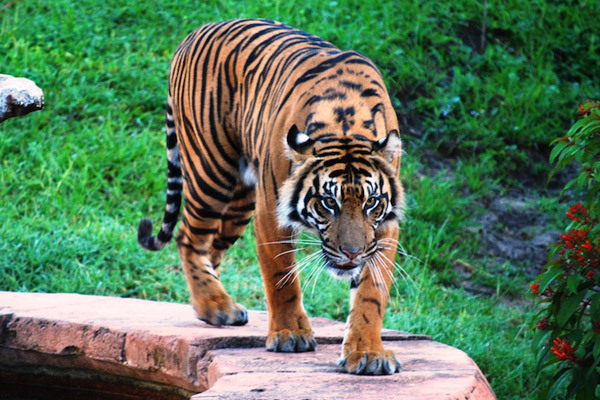 This self-guided walking tour at Disney's Animal Kingdom allows you to get up close to an assortment of animals native to Southeast Asia including Komodo dragons, massive flying foxes, rare lion-tailed macaque monkeys and the main attraction – tigers. This area is only accessible by the Wildlife Express Train, which is a fun behind-the-scenes ride through the African savanna, taking you from Harambe to Rafiki’s Planet Watch. Planet Watch is dedicated to learning about conservation. Here kids can visit the Affection Section, the only petting zoo at Animal Kingdom. Children can pet, brush and feed friendly animals like goats, sheep, donkeys, cows and pigs. This attraction at Epcot begins with a fun adventure through the world of Finding Nemo, but after disembarking the ride you're free to explore a massive aquarium that's home to over 6,000 inhabitants. You can see and learn all about real sea turtles, dolphins, rays and other creatures in this 5.7-million-gallon saltwater aquarium. Hands-on exhibits teach kids about shark safety and more. Plus, don't miss the amazing color changing cuttlefish tank upstairs!